Come out and support Autism Health Insurance Reform! We need your support NOW if we are going to make autism health insurance reform happen THIS YEAR. If not, it will be 2 more years before we have another chance to get legislation passed. 9:00 am: Gather in Room 350 for information and to prepare to visit your legislators. This room will be open to us all day to rest and relax. 9:30 am – 12 noon: Information tables will be open in the Capitol Galleria. NEW TIME! 12:30 pm: RALLY on the Capitol steps! Note the new time for the Rally – at the request of legislators, we will start the rally at 12:30 PM (half an hour earlier that originally announced) so that some legislators can join us before their afternoon committee meetings. If you will be upset if autism health insurance reform does not pass this year, make sure that your voice is heard at Autism Awareness Day. If you haven’t already done so, please contact your state legislators in advance to make an appointment to see them. (To find your legislator and contact info, go to: http://www.leg.state.or.us/findlegsltr/). It doesn’t need to be long and you just need to state your support for autism health insurance reform (SB 365). Tell them your personal story, if you wish. If you can’t attend, please call or email your state legislators this Friday, March 22nd to let them know of your support for autism health insurance reform (SB 365). All statements of support are very helpful! Transportation – where to park? : Carpools and public transportation are strongly encouraged, but parking is available. The cheapest parking is in theYellow Lot, located on Center Street, between Winter & Summer Streets. The cost is $6 for the full day and the machines accept credit cards. It’s a short 2 block walk to the Capitol Building. But, this lot fills up early. There are many street meters with times ranging from 3-10 hours. They take coins only and cost $1.50 per hour. The best option is to purchase a day pass in the Legislative Services Office in the basement of Capitol building. Cost is $8.00 for all day, cash only. We will have a place to sit and rest in Room 350, and have a quiet area set aside in the room. The windows can be latched but not locked. There is a small cafeteria in the basement of the Capitol. Across the street and on either side of the building, there are green areas to run around in, but no play equipment. Tours of the Capitol Building will be available at 10:30 am and 2:00 pm. These are suitable for 4th graders and older. Less than a 10 minute drive away is the Gilbert’s Discovery Village (click here for information) which has hands-on exhibits and a great outdoor play area. Check with them about their reciprocal admissions if you have a membership to another Children’s Museum. Need help, or have questions? Contact the Autism Society of Oregon’s office by phone at 1-888-AUTISM-1 or send a message to Tobi Rates. 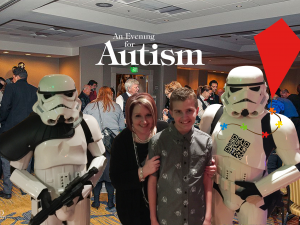 This entry was posted in Events, News, News and Updates and tagged Autism, awareness, legislature, oregon. Bookmark the permalink.